In celebration of Presidents day, AppliancesConnection is offering 25% off on qualifying appliances, plus get free in-home delivery and no sales tax if you are not from NY State. Also, you can save more by using the coupon codes and the rebates. Additionally, AppliancesConnection is offering an installation allowance of $75. A few of the brands are having their own rebates, like Bosch, Fisher & Paykel, Frigidaire and GE Cafe. Bosch is offering a $300 mail in rebate on its cooktops and a $200 mail in rebate on the dishwashers. Fisher & Paykel is offering a free 3 year warranty when you buy a dishwasher. 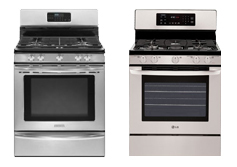 Get $200 off on the cooktops and oven packages. Get up to $500 off on qualifying GE Cafe appliances and $750 off on selected GE Caf appliance packages. Get up to $325 rebate with qualifying purchase of appliances; Get $125 off on Refrigerators, $100-$75 off on Ranges, $50-$25 off on Microwave and $40 off on Top Freezer. Get $100 rebate on Frigidaire Affinity Steam Washer and matching Dryer. And up to 10% off on the qualified professional series appliances.